INTEMPCO has released a new family of LTU series ultrasonic level probes. The LTU10 is the most powerful and penetrating sensor in this family. 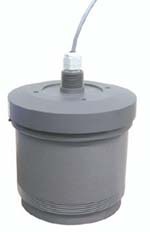 It is relatively large and features a PVC housing with 6” NPT face mounting and 1” NPT cover mounting. Due to its high power output, the LTU10 is capable of measuring dry bulk powders under dusty conditions up to 90ft range.